Stockholm County, home to 2,1 million. Suitable to study as a bio-region? I got asked yesterday by a friend involved in an EU project about my ideas for accelerating transition in the Stockholm area. The project is called ARTS (Accelerating and Rescaling Transitions to Sustainability) and is committed to understanding the role and impact of transition initiatives in cities and examining the conditions that can aid accelerating change towards a sustainable low-carbon society. I was busy yesterday and today is too late, but as an academic exercise I thought I might give my two-pennies worth. They have already decided direction for the next season. I think that the research project should build on the experience so far of Transition Network, the organisation started in England to promote grass-roots action to building a resilient society. Top of the list of objectives with resilience is boosting inclusiveness, food security, adapting to de-fossilisation of society and coping with climate change. A world driven by fossil fuels tends to look same-y. When transitioning and relying on local sources of energy and food, as well as dealing with local climate, solutions tend to look different. For example, highly urbanised areas in cold climates have a challenge of keeping food available all year round affecting diets, storage techniques and transport solutions. In order to deal with place it is necessary to define the place. This is one thing transition initiatives tend to give some thought to…. what geographical area are they targeting, and how this area relatse to juridical boundaries and bio-regional considerations. Define whether the county of Stockholm is the target or the region of Mälardalen is the target under study. The ARTS Web-site identifies Stockholm County, but the call for input described the Mälardalen valley where Stockholm is situated. Is the region of Mälardalen one bio-region or does it comprise several others? Match political boundaries with ecological boundaries. Identify local foods where possible. Look into transition in harmony with the bioregion. Map edges. Edges in this case are where the bio-region is not able to, or close to not being able to, support the people living in it. Of particular importance is water shed and water shed management. Mälardalen is an area identified as a potential water challenged area. Another edge might be Phosphorus and Nitrogen flows. How much rock-based phosphorus and fossil fuel-based nitrogen fertilisers are imported to the bio-region. How much exits via the water shed. A third “edge” to map is the use of fossil fuel in the bio-region. How much is used, and for what. Particularly blue light services and agriculture. Focussing on a region, understanding its bio-regionality and mapping edges gives a good basis for understanding the potential of smaller initiatives to contribute to whole. For example, what would be the resiliential impact if everyone had urine-separating toilets? All initiatives should be mapped, and categorised against the edges. These initiatives can be used to address the edges. Even some edges can be mapped against bio.region resources, for example, housing shortages against local materials available, food security against wild food plants, transition initiatives addressing edges – like community supported agriculture that addresses food security. EXPERIENCE #2 Action is preceded by awareness to knowledge. People “do” Transition as soon as they understand what it is all about and have reached a point within themselves where they have the conviction to move to action. For some, they watch a film like “in Transtion” and immediately commit to growing some of their own food on allotments. Others, see the film and continue to be doubtful as to what they could personally do and how. Some go into research mode and learn and learn and learn until they, to are ready to act. that these people took from information to action. Not that all will follow, but conclusions might be drawn on the kind of information that helps people transition, especially the kinds of information barriers, that once overcome, will lead to active involvement. This research holds potential for understand how Transition can happen just in the Swedish Culture, even in the city culture and the cultures in the city (various religions and ethnic culture but also youth, hipster, etc) and play a role in understanding how Swedish media and arts and culture can help. EXPERIENCE # 3 Trash catchers are we all. Looking at waste says a lot about a society. Several initiatives have focussed on turning waste into something useful. EXPERIENCE #4 We all have to eat. Food security must come high up on the list of any transitioner. With the large involvement of fossil fuels in food provision today, food insecurity as a result of defossilisation must be a priority to study. Suggestion #6: identify all initiatives in the region that have the potential to scale into fossil-free agriculture solutions. Inventory those with the capabilities and skills, even if their production volumes are low. Investigate these initiatives to see what the barriers and opportunities there are to scaling. Suggestion #7: Do an analysis of the bio-region’s ability to feed itself. This requires mapping where fertile soil is, where market gardens are, where food distribution is taking place etc. And competence. Identify all those who can contribute to showing and teaching other ways. For example, of highest importance in CUBA were the oxen breeders and trainers who were pivotal when tractors stopped working as the supplies of diesel dried up thanks to the crash of the soviet union. Most people are either workers in organisations or manage organisations. The forms of these organisation are given by law and workers are used to following orders, doing their jobs, and getting paid. It doesn’t work like that in Transition which is individual impetus driven. It’s up to the people who are doing it, most is voluntary and there are no bosses. But there are leaders. Different kinds of leaders. The whole idea of what work is, how to organise it and share the results is up for grabs. Old paradigms of the corporation and corporate control through command and control are probably not going to take us to meet the challenges of the 21st century. But what else is there? Suggestion #8: Identify new forms of organisation and identify what is being practised in the area. (Examples: holocracy, sociocracy, dragon dreaming, gift society, circle way, intentional communities, CSA, etc ) These form potential centers of learning and can be potentially scaled. We can even learn a lot from failed attempts at new forms of cooperation. Transition Initiatives have identified that they want to create resilience in their areas, rather than sustainability. 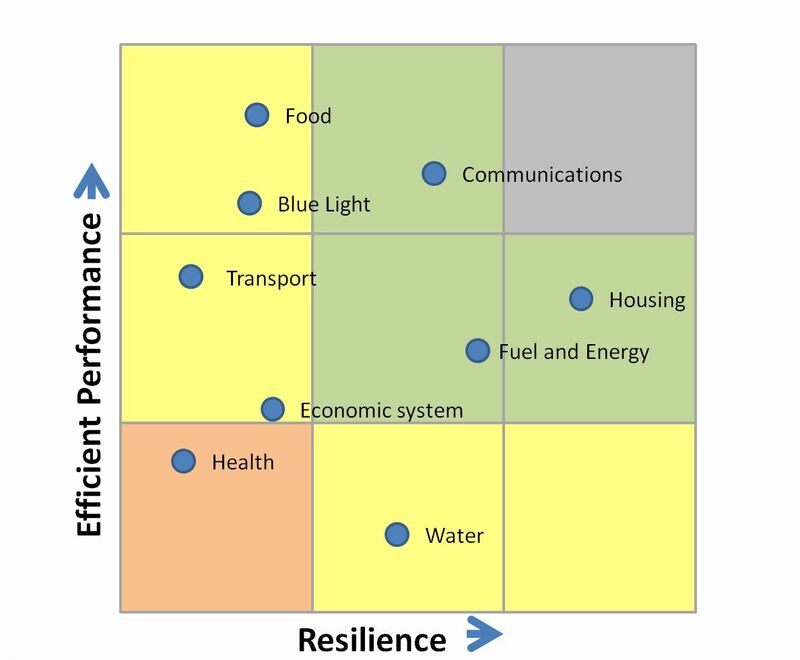 It is possible to be environmentally good, but not resilient. You can have a low ecological footprint but be unable to handle the knocks and pressures of, for example, global economic downturn, climate disturbances, or fossil fuel shortages. So being environmental is but a step on the way to becoming resilient. The opposite of resilience is efficiency. Efficiency is often about having one solution (not bothering with other, redundant, solutions). Resilience is about having more options. I like the idea of three. The idea of three is taught in survival classes: have three ways to make fire, three ways to get water, three ways of keeping in touch with your group, etc. You can make a crude measure of resilience by listing the essential services in the bio region, and identifying the number of alternatives that are available for each. The more alternatives, the higher the resilience. This diagram below gives you an idea of what such an analysis might look like. The analysis will give you an idea of where to start work. I’d say that those services that are both non-resilient and not performing efficiently are targets for investigation. In the example above, provision of health services is both inefficient and has low resilience. The next study object might be the payments and transactions systems. In the Swedish case, they are going more and more to rely on digital money. If the internet and electricity fail, there will be no money system. Here, experiments with more resilient, robust forms of money would be important to study.